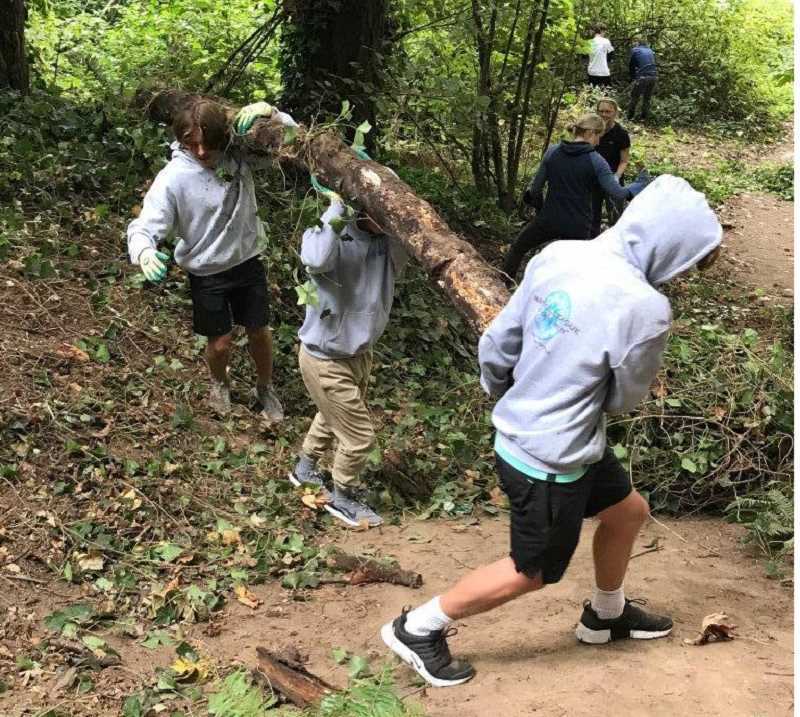 Teams of high school boys and their mothers spent Saturday morning working at Mary S. Young State Park in West Linn — pulling ivy, picking up trash from along the beach and spreading bark along the park's trails. 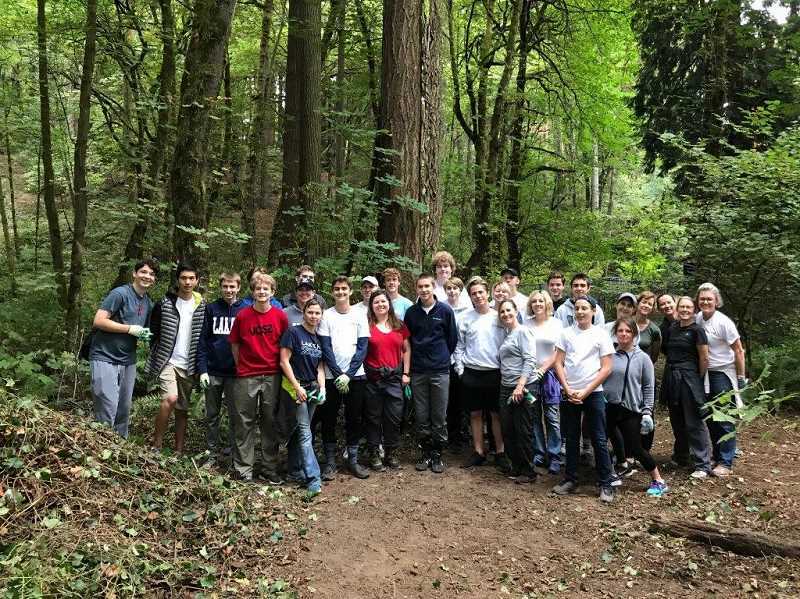 It was the first philanthropy event of the school year for the Lake Oswego chapter of the National League of Young Men (NLYM), which "promotes the development of young men into community leaders through leadership involvement, charitable and community service, cultural experiences and protocol education." The nonprofit organization started in Newport Beach, Calif., and now boasts 14 chapters, although Lake Oswego is the only one in Oregon. Saturday's project was a partnership between NLYM and SOLVE Oregon, a nonprofit dedicated to keeping the state clean and thriving through projects like litter cleanups, invasive plant removal and planting native trees and shrubs. Every year, SOLVE works with nearly 30,000 volunteers on 900 projects throughout the state. 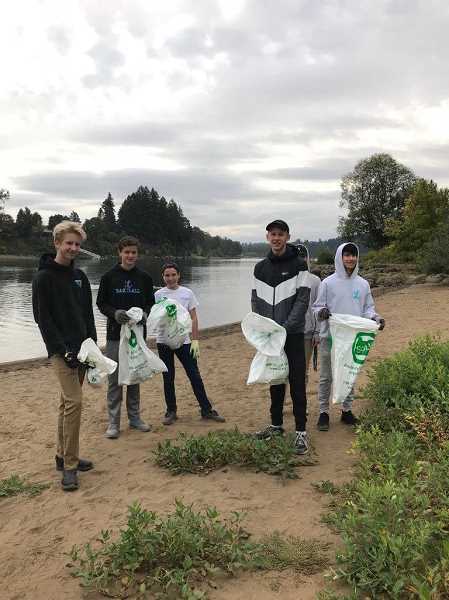 Nearly 100 NLYM members attended the cleanup on Saturday, including Lakeridge student Alex Abbott, who said he enjoys all of the group's philanthropy events but is especially fond of those that benefit the environment. "I'm really interested in global warming and helping the environment. I like that we can do our part to help our environment and our own community," he said. "I like that we are able to spread positivity to each other and the community. It's a really positive environment to be in." Pierce Boucher, who spent most of the morning pulling ivy, said he was surprised by the task. "It was definitely harder work than a lot of us were expecting," he said. "Everyone got a workout today." 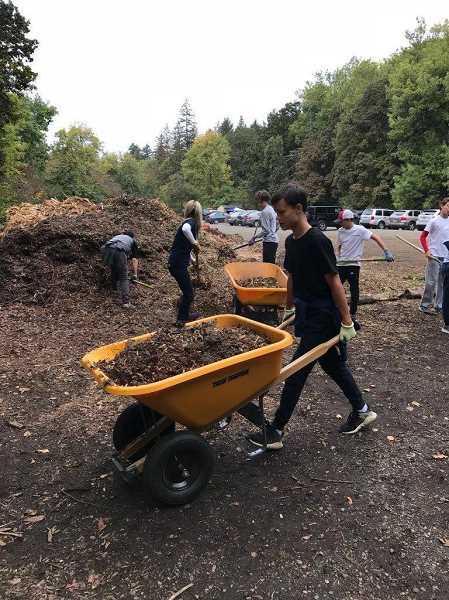 Lisa Oliver, the Lake Oswego chapter's philanthropy chair, said the beach and park cleanup was inspired by an event put on by one of NLYM's other chapters. "The National League of Young Men is based out of Los Angeles and they always do a beach cleanup philanthropy event. I wanted to figure out a way to do something like that," she said. "When I found Mary S. Young Park, I started to realize that there were a lot of different jobs we could do here." Oliver said she liked that there were different types of tasks available for volunteers at the park. "I think we had a good mix of strenuous manual labor and then some things that weren't so much. Everybody really seemed to have fun," she said. "People were doing different tasks, but everyone came back happy and hungry at the end of it." NLYM member Alex Malmors said he enjoyed the day but that he likes being a member of the organization for a variety of reasons. "It's fun to help people out. I enjoyed today because we got to work on the beach of the river," he said. "But I also like talking with the other guys and getting to know more people better." For more information on the National League of Young Men, including a list of upcoming events, visit www.nlymlakeoswego.org.